Elaborate genome rearrangements take nesting to the extreme. Oxytricha trifallax is a single-celled virtuoso of genome rearrangement. Oxytricha is a ciliate, and like all ciliates, it has two nuclei: a tiny, germline micronucleus and a large, somatic macronucleus. Mating brings together two micronuclei, and the daughter cell creates a new macronucleus out of the zygotic micronucleus in an intricate process of cutting and splicing. Though all ciliates reproduce this way, Oxytricha takes the genome shuffling to an even more massive scale, deleting 90% of the non-coding genomic information and rearranging the remaining sequences into millions of short chromosomes—each large enough to contain only one or a handful of genes. In G3: Genes|Genomes|Genetics, Braun et al. describe a peculiar feature of these already strange genomes. They explore cases where some parts of the genes retained in the macronucleus are located in the eliminated sequences of other genes. 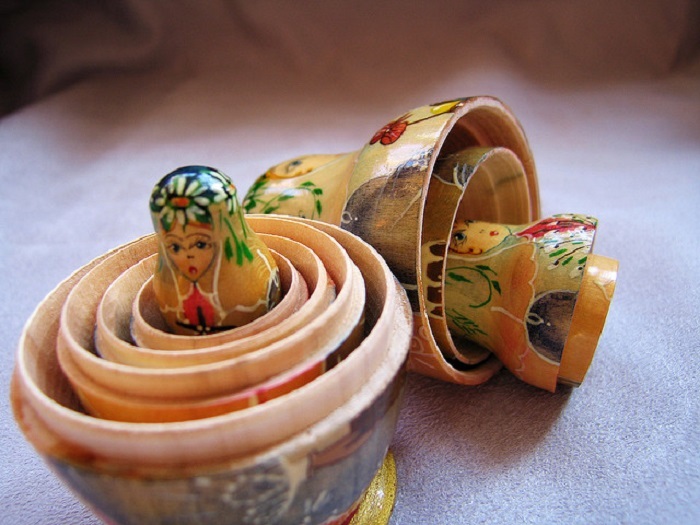 The authors compare these genes to matryoshka, or Russian nesting dolls, since they are nestled into each other. These arrangements are not always as straightforward as one gene contained within another. Some genes are interwoven across multiple levels of nesting, with as many as four different genes’ coding sequences contained within the eliminated regions of another gene. Often, these sequences are scrambled together with individual genes out of order, suggesting that complex regulatory processes must be needed to properly rearrange them to achieve their final macronuclear form. To analyze these tangled patterns, the authors developed new methods for mathematically describing the nesting and scrambling of genes. Their observations raise many questions about these convoluted genomic architectures. Future investigations could explore whether nesting affects any properties of the gene, or look for clues to the evolutionary pressures that drive the genome to such extraordinary complexity. Intrigued by ciliates? The Ciliate Molecular Biology Conference will be held July 17 – July 22, 2018 in Washington, DC. Abstracts are due this week, April 4!